In this file photo, the Palme d'Or Award is displayed at he Closing Ceremony during the 59th International Cannes Film Festival May 28, 2006 in Cannes, France. As the Palme d'Or sits in its cushioned box awaiting Sunday's Cannes winner, the film festival's top prize might be taking stock of its own lifetime of achievements — on this, its 60th birthday. 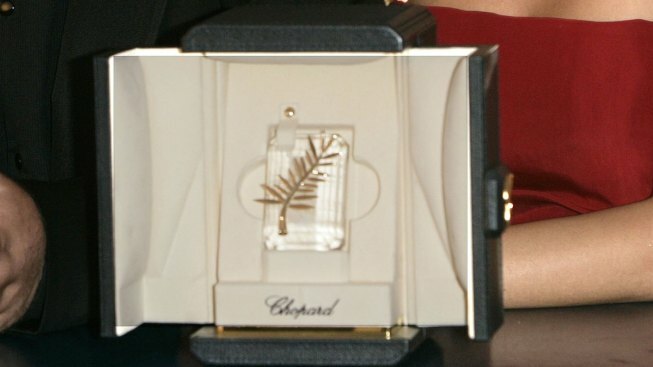 The iconic award — with its gold palm branch that was redesigned last year by Chopard — was honored at this year's festival. A film directed by Alexis Veller, called "The Legend of the Palme d'Or," was screened, including interviews with many of the award's recipients such as Quentin Tarantino, Martin Scorsese and Jane Campion. The Palm is made of massive 18-carat "Fairmined" gold, hand-cast in a plaster mould, then fixed on a cushion of unique cut crystal.